I recently had my friend and English teacher trainer extraordinaire visit me in Suncheon to do some photography for an article he was making about Suncheon bay. I’ve been to the bay on many occasions, and it has to be said for many foreigners the experience is distinctly underwhelming given the build up the place is given. I’ve grown to really love and appreciate this little piece of nature about 30 minutes outside of my town of residence, not least because I’ve got some very nice photos from there. I’ve always felt I’ve missed out on seeing a really good sunset from this park, you could certainly say I’ve been very much underwhelmed by the sunsets up there. That was all about to change with this particular visit. I just knew it would be this way as well…. Me visiting this place quite a few times and seeing the sun disappear into the clouds just as it was setting, and my friend who was visiting this place for the first time and hits the back of the net at the first time of asking. I should of course introduce my friend. He’s Peter DeMarco and hails from the US of A, but he currently calls Busan his home. He’s travelled around a fair bit though and did a fairly long stint in Barcelona before moving to Korea. Having just got back from Jinju that morning I met Pete in the afternoon got a bite to eat and then headed to the bay. We jumped onto the 67 bus and sat for about 30 minutes as it trundled through the south Jeolla countryside, with rice fields on either side of us. When we arrived Pete was greeted with a site I think he wasn’t quite expecting, 100’s of people. It being a nice sunny day, and a weekend Suncheon bay was packed. The walkways that wind their way through the bay were like conveyor belts of people, and hardly the tranquil atmosphere I think my friend was expecting. As I told him though it gets better from the viewpoint on mount Young. They’ve done a lot of work on the bay in recent years, and the new path and additional features on the small mountain add something to the views I feel. The bay has several places you can stop and admire the view, though the best is still the last place. A testament to how popular this view is to Koreans was the legion of photographers already at the viewpoint a full 2 hours before sunset. We were lucky to get any kind of position to shoot the view at all, such was the crowd of tripods up there. The time passed fairly swiftly, I took a few photos of some wine glasses I’d brought up with me. The very best view though was to be after sunset, and after all the other photographers had packed up and gone home. I’d got chatting to a few Koreans while up at the observatory, whom I met a few days later in Suncheon for some BBQ duck, and jolly nice they were too. Anyway perhaps 20 minutes after the sun had disappeared the sky went pink and we witnessed a rather magical sunset. I’ve always thought really good sunsets need interesting cloud formations and this was made more beautiful for just that reason. Having got back to Suncheon we had an evening meal at Blank. I had my usual there, the honey mustard chicken sandwich aka the sandwich of kings! I really should explore the menu down there, just I love that sandwich. Pete followed suit and ordered the same as me. Blank is a little oasis of style in the centre of Suncheon, I hope one day that becomes a district. After eating we headed to San Antonio’s for a drink and chat with Jose, who was waxing lyrical about Dubai. 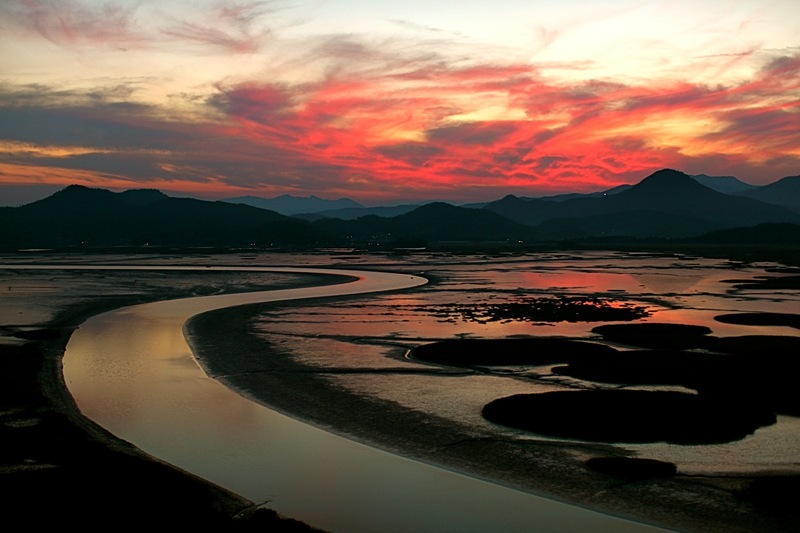 I had the good fortune to visit Suncheon Man twice in November last year. The reeds boardwalk and the wetlands were absolutely gorgeous. I absolutely loved the place.